Chapeau de Velours. Carrick et Guêtres de Drap. Hand-coloured fashion engraving. 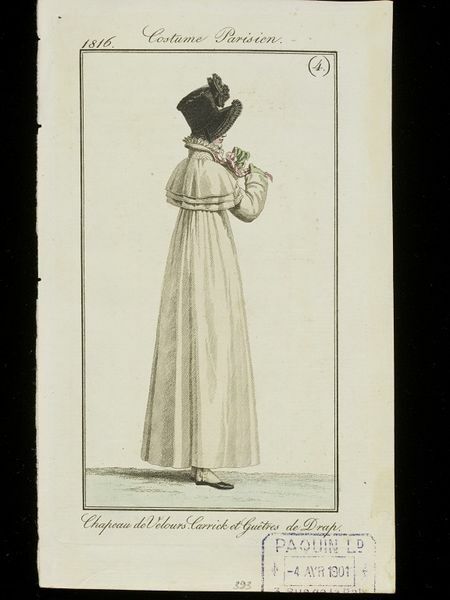 Woman in a buff-coloured long coat called a carrick, in the coachman's style with layered shoulder capes, wearing a whitework neck ruff and a long red and white striped scarf and matching buff-coloured gaiters, with a black beaver felt bonnet edged with black lace frills. 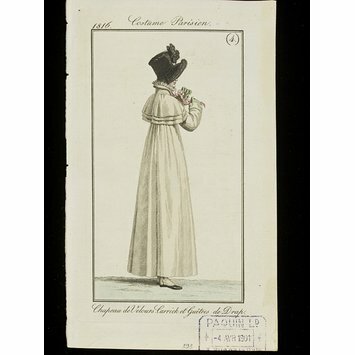 This print is part of a very large collection of reference material including fashion plates, engravings, original drawings and illustrations that were collected by the fashion design house of Paquin at the turn of the 19th/20th centuries. Many bear the stamp of Paquin's archivist at the time. They were acquired by the V&A in 1957 when, following the closure of the combined houses of Paquin and Worth, the Worth/Paquin archives and design books were donated to the Museum. Woman's coachman's coat or "carrick". Hand-coloured fashion plate from Costumes Parisiens. Paris, 1816.